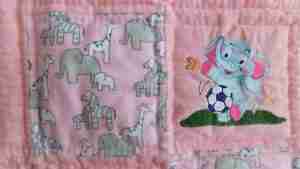 Elephants in Pink and Grey – Handmade Baby Quilt for Girls is perfect for your little lady who loves elephants and other zoo animals. The soft shades of pastel pink, light grey and white, made of 100% cotton baby flannel, is by complimented by hand quilted blocks designed with embroidered elephants at play. 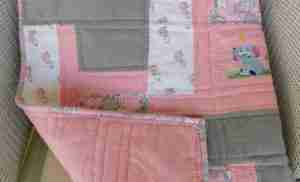 Backing material is a pastel light pink made of 100% cotton baby flannel perfect for reversing the quilt. Are you looking for baby shower gifts to cuddle and hug the new baby? If I could change the world: Snuggle would be a term reserved not just for the very young, but those of all ages. As your dear little one begins to comprehend her world, she can understand that you have provided her with a source of constant comfort and snuggly pleasure. No one outgrows loving the feel-good sensation of cuddling with something soft and warm and safe. She’ll be able to take her quilt with her to strange new places and always feel sure that she has something safe and familiar to cling to. Hand quilted for durability. The binding is hand stitched in the same soft pastel elephant print from the front design. This is one great baby shower gift for new parents so they can begin a lifetime of snuggling their new baby. Size is 34 x 44 inches. 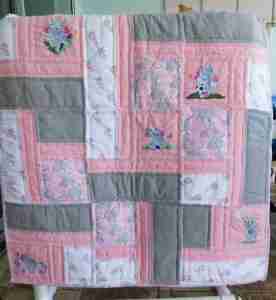 Elephants in Pink and Grey – Handmade Baby Quilt for Girls is hand quilted with love for your little bundle of joy by Sharon, The Baby Quilt Lady.